Caught! (but only on camera). When I got down to the river the other day it was low, very low. The water was clear and the weeds were dying back so there should (I thought) be no problem spinning. However, for some reason there was loads of weed drifting downstream. Nothing too big but lots of little bits of Ranunculus - just enough to foul the lure and stop it working almost every cast. I tied on a J9 plug and fished for a while, hoping for a seatrout but, apart from one brownie of about a pound that grabbed it in the shallows, splashed clear of the water and came off, nothing!. Time was pressing on so I decided to have half-an-hour with a pike lure. I fastened on the long, rubber lure that caught me some good pike last season and walked along casting into what I thought were likely places. The lure fished and wriggled along nicely but for a while there was no sign of life. In fact I was just about to pack in when I decided to have a 'last cast' into a deep slow pool. As the lure trundled along in the depths, till clearly visible, there was a flash of green and I found myself hooked into a moderate pike. After the problems I had reaching fish without a net last time I tried fishing I had clipped my small net to the bag on my back using the artery forceps (I hate lugging nets about when I'm fishing). Anyway, I decided to take a picture of the fish on my line before I netted it. 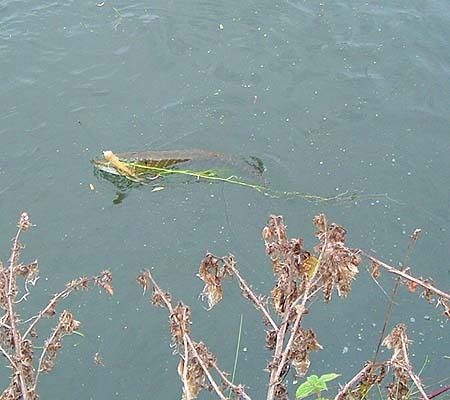 The pike (only five or six pounds) was decidedly lively and for a minute or two it kept surging away and gradually it picked up a sizable clump of drifting weed. By holding the rod in one hand and the camera in the other I was eventually able to get a picture. I slipped the camera into my pocket and stooped to pick up the net. As I did so the line went slack and the pike swam away - that's the problem with trying to get pictures of fish in the water! Talking about pike I had a recent email from a friend Chris Harrison. Chris had been watching a pike from a bridge. The fish swam in under some weeds and following a bit of a commotion swam out again chomping (a fish?). The curious thing was that when the fish emerged it had 'lit up' to almost a lime green colour. Now I know that marlin and some other tropical predators light up with glowing colours when they are feeding but I've never heard of pike doing it. Any comments????? ?